HAYWARD, CALIFORNIA - Early on a bright fall morning, dozens of black-necked stilts pick their way across a shallow pond at the edge of San Francisco Bay, feeding on tiny floating brine shrimp. Each bird is about a foot tall, with a black face and back, white undersides and spindly red legs. The water is so calm that they seem to walk on a mirror, bending down to admire their own reflections. The setting is Eden Landing, a complex of manmade ponds next to the San Mateo/Hayward Bridge. It's a tranquil scene but hardly paradise: Commuter traffic buzzes past, jets descend to nearby airports, and a rising breeze carries whiffs of rot from a shoreline landfill. The ponds themselves are industrial sites, built decades ago to make salt by concentrating and evaporating bay water. Viewed from the air, the progression of ponds look like colored tiles: First, algae tints the "starter" ponds green, then brine shrimp and salt-loving bacteria turn the thickening solution orange and finally red. Before the Gold Rush, San Francisco Bay was bordered by 200,000 acres of tidal marshes that provided rich habitat for fish and birds. Today, 90 percent of those tracts have been filled in for farming, development and salt making. This spring, state and federal agencies will launch a 50-year program to convert up to 15,000 acres of salt ponds back into tidal wetlands. Most wetlands in the West lie inland, but those in coastal estuaries (mixed saltwater and freshwater zones) like San Francisco Bay have special biological and economic value. They support millions of birds that migrate along the Pacific Flyway and provide spawning grounds for many fish and shellfish species. Wetlands also are natural sponges that soak up flood tides - a service that will become more critical as global warming raises sea levels. The salt-pond project dwarfs other wetland restoration initiatives in the West, which typically cover a few thousand acres at most. Working at this scale could yield major payoffs, says David Lewis, executive director of Save The Bay. "San Francisco Bay is part of a huge ecosystem," Lewis says. "Forty percent of California's watershed flows into it, so improving the health of the Bay can have a big impact." Project managers are analyzing many intricate issues, such as sediment flows in the Bay and birds' foraging habits in ponds and marshes. But the biggest challenges are economic and political. No central structure exists to coordinate the many federal, state and local agencies involved in the project or raise enough money to completely restore the salt ponds and other wetlands around the Bay. Meanwhile, new shoreline development proposals divert energy and government attention from the slower work of bringing wetlands back to life. 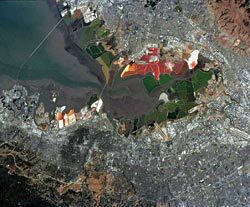 The second-largest estuary in the nation, San Francisco Bay is ringed by highways and 7 million people but still provides nesting and breeding grounds for birds, fish and mammals. Dozens of endangered or threatened species use the estuary, including the brown pelican, Delta smelt, and northern sea lion. Local advocates have been lobbying to clean up the Bay since the 1960s, when raw sewage flowed straight into it and only four of its 276 miles of shoreline were publicly accessible. Starting in 1972, groups like Save the Bay helped to build support for restoring some 5,000 acres of tidal marsh. When Cargill Salt, which owned many of the area's salt ponds, decided to consolidate its holdings in 2000, advocates saw a bigger opportunity. With private foundation support, a partnership of state and federal agencies bought three tracts of salt ponds for $100 million. Cargill sold the ponds as-is. Many are full of highly saline brine, so the first step in restoring them is letting water flow in to recreate natural tidal patterns. "We've simplified the ecology of the Bay over time by creating a very hard, diked edge," says Lynne Trulio, professor of environmental studies at San Jose State University and the project's science team leader. "Restoring tidal action and marsh vegetation aims to remedy that and make the South Bay ecosystem richer and more self-sustaining." In 2004, managers installed tidal gates to cycle water periodically through some ponds. Salinity levels fell, and the ponds supported growing numbers of shrimp, flies and fish, which in turn drew dunlins, sandpipers and many species of ducks. The change was bigger and faster than expected: Counts of some species rose as much as sevenfold in the first year. When three isolated "island" ponds that had only been used by gulls were breached permanently in 2006, thousands of shorebirds and fish-eating birds immediately began feeding there. The long-term restoration plan, which is jointly managed by the U.S. Fish and Wildlife Service, the California State Coastal Conservancy, and the California Department of Fish and Game, calls for converting 50 to 90 percent of the ponds to tidal wetlands. Some will remain as "managed" ponds that can be customized for certain bird species. By adding islands or changing water depths, wildlife managers can create different habitats for birds that forage or nest in and around the ponds, such as the western snowy plover, a threatened species that nests on salt pond islands and levees.